So: what makes the two-prong outlets unsafe, anyway? To understand that, it helps to understand how two and three-prong outlets work in general. Both two-prong and three-prong outlets have a hot wire and a neutral wire. The hot wire carries electricity from your electrical panel to the outlet. The neutral wire carries electricity back to the electrical panel. The major difference between the two outlets is that three-prong outlets also includes a third “ground” wire. The ground wire provides a safe “exit” for extra voltage that remains inside a circuit after it supplies power. Two-prong outlets don’t have that ground wire, so they can’t safely divert extra electricity into the ground. What is the “Extra electricity” three-prong outlets divert? Most outlets handle up to 120 volts of electricity. Sometimes, however, more volts of electricity can enter a closed circuit than they’re designed to handle. Extra electricity can be dangerous because it can overload connected fixtures, burn through wires, or leave the closed system. That’s when the ground wire diverts the extra electricity and “grounds” it. By diverting extra electricity into the ground, a three-prong outlet prevents it from hurting you or your electrical devices. Two-prong outlets can’t ground extra electricity, which means it could overload devices, damage wiring, or even harm you. That’s why you should replace two-prong outlets with three-prong outlets. Upgrading to grounded outlets is your best option, but doing that is a relatively involved process. For every outlet you’re grounding, you’ll have to install a ground wire. These ground wires have to run from the main electrical box all the way to the outlet you’re upgrading. That’s a pretty big job, so you might want to call an electrician for help. Even if you don’t want to add ground wires, you could still replace two-prong outlets with three-prong GFCI outlets. If you read the GFCI blog, you know GFCI is short for Ground Fault Circuit Interrupter. GFCIs shut off the flow of electricity if there’s a danger of shock, fire, or damage. It’s important to remember, however, that GFCI outlets don’t ground voltage. The dangerous electricity isn’t diverted when GFCIs shut down outlets; it just doesn’t move into the outlet. Turn off power to the outlet being replaced from the service panel. Use a circuit tester to make absolutely sure the outlet isn’t powered before you continue. Remove the cover plate and the screws holding the old receptacle into the box. Gently pull out the old outlet so you have access to the wires. Do this very carefully; you don’t want to crack the old wiring. Disconnect the old outlet and put it to the side. Now it’s time to connect the new three-prong GFCI outlet. Here, you might face some challenges. If the new outlet is too big for the box, you may need to replace the old box. If the wires aren’t long enough, you can add a 6” extension “pigtail.” Be sure to use the right wire for the amperage: 15 amp = 14 gauge; 20 amp = 12 gauge. If/when the wires are long enough, connect the black wire to the brass “line” terminal screw. Connect the white wire to the silver “line” terminal screw. Gently fold the wires back in and push the new outlet into the box. Fasten the box with screws. Finally, test the outlet. Push RESET to turn it on and TEST to shut it off. Re-attach the cover plate. Your GFCI outlet probably came with a NOT GROUNDED sticker. Put that on the cover plate, and you’re done! Your unsafe two-prong outlets have been replaced with safer GFCI outlets. In the event of fire, shock, or other damage, that outlet will automatically break its connection with its power. It’s not quite as safe an option as installing ground wires, but it’s much better than nothing. If you want some help making your outlets safer, you can always call EarlyBird. 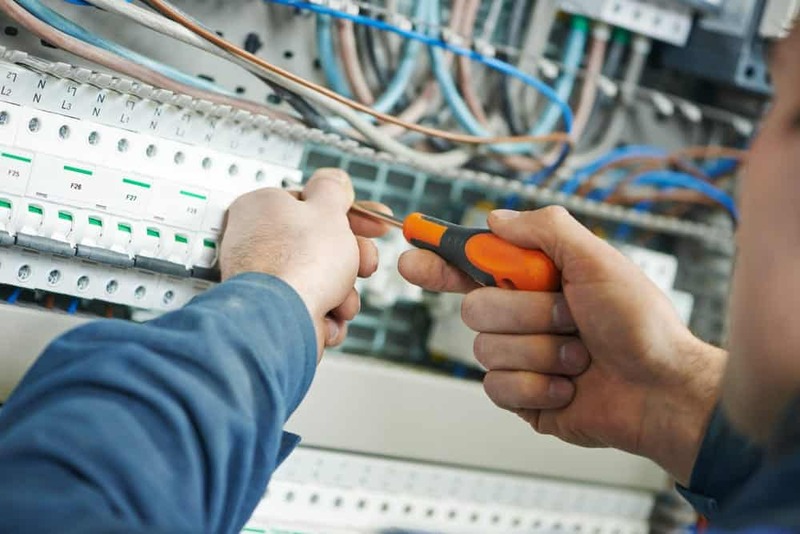 Whether you want new grounded wires or help installing GFCI outlets, we’re here to help. Don’t take the risk any longer; switch to three-prong outlets today!